"Quality Workmanship / Competitive Price"
$125 Off On Asphalt Jobs $4200 Or More. Acme Paving & Seal Coating guarantees the quality of service and customer satisfaction. You can trust Acme Paving with there quality work. We offer full service solutions to all your asphalt needs. We will handle all your asphalt paving needs. We warranty our work and can service all our customers paving needs. 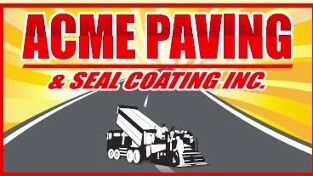 Acme Paving is a family owned & operated business with over 25 plus years of experience. Father or Son will be onsite to answer any of your questions and listen to your needs. Father and or son will be also on the jobsite while the work is being performed.They will stay onsite from start to finish of your job guaranteed.We take pride in our work doesn't matter if its a small patch or full size parking lot / driveway. We do every job the right way without cutting corners. Acme Paving Serves Large Area: All King, All Pierce, Kitsap Up To Port Orchard and North Snohomish Counties. Seattle, Shoreline, Tacoma, Gig Harbor, Bellevue, Lynnwood, Woodinville, Fall City, Auburn, Puyallup, And Lots Of More Areas. Professional references available upon request! We own all our equipment, dump trucks, excavator, bobcat, vibratory rollers, plate compactors, asphalt pavers, trailers and other hand tools needed for the job.